Laugh N' Leap is your premier company for inflatable bounce house rentals in Columbia, SC. We provide prompt and reliable recreation for any occasion. 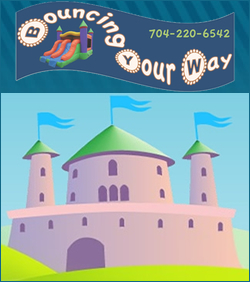 Jump Castles, Bounce Houses, Slides, Obstacle Courses for any event delivered to you! We are based in Johnston and Saluda but sere Edgefield, Greenwood and surrounding areas for birthdays, churches or any occasion. We have bounce houses and slides for all events inside and out. Rock Climb Slide, Wet/Dry Slide, 15X15 Yellow Castle, 15x15 Sponge Bob, 28' Obstacle Cource. We can provide games, inflatables, concession equipment, tents, ultimate shower, equipment can be set up inside or outside. Add a South Carolina Bounce Business! Advertise your South Carolina bounce house business in this inflatable rentals resource and have your South Carolina inflatables business information appear across multiple Children's Party and Kids Event rental websites. Bounce House Guide is the most complete online resource of South Carolina Bounce House Rental information. Find a South Carolina Bounce House For Rent, Themed Bounce Houses, search for Moonwalks, Jumping Castles, South Carolina Inflatables, Obstacle Courses, Sumo Suits, Bungy Trampolines, Jousting, South Carolina Giant Slides, Water Slides, Party Rentals, Carnival Games, Concessions, Fun Food, Dunk Tanks, Table and Chair Rentals, Photo Booths, South Carolina Festival Rentals, South Carolina Event Rentals, and more! Do you own a South Carolina Jump Bounce Business? We also feature HOT ways to advertise and market your South Carolina Bouncey House Business. Add a South Carolina Bounce House Business or take advantage of our Premium Bounce Advertising & Featured Listings. Buy or Sell Equipment in the Inflatables Classifieds. Promote your South Carolina inflatable business with Jump Bounce Marketing Products, browse the Bounce House Blog, follow Bounce House Social Media on facebook Jump Bounce Rentals or twitter Jump Bounce Rentals, discover multi-site marketing with the Kids Party Resource Network, or Advertise a South Carolina Bounce House Business For Sale.